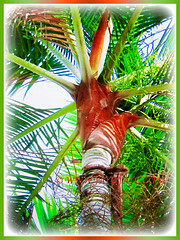 Redneck Palm or Teddy Bear Palm is one of the most unique ornamental palms of Madagascar. It has a very distinctive reddish-brown tomentum on the crownshaft that resembles a teddybear’s fuzz and a white waxy trunk. Definitely, an impressive and majestic palm that is excellent for landscaping. Dypsis leptocheilos is considered critically endangered by the IUCN Red List of Threatened Species. Botanical Name: Dypsis leptocheilos (syn. : Dypsis redneck, Dypsis darianii, Neodypsis leptocheilos). Common Names: Redneck Palm, Teddy Bear Palm, Red Fuzzy Palm. Etymology: The genus Dypsis is derived from the Greek dyptein, to dip or dive, in reference to its dipping tips of the fronds. Its species epithet leptocheilos comes from two words in Latin, thin and lip. 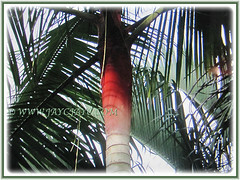 Its red and fuzzy leaf sheathes and crownshaft give rise to its common names, Teddy Bear Palm and Redneck Palm. Origin: Native to West Madagascar, Tanzania and various islands in the Indian Ocean including Mauritius and Comoros. 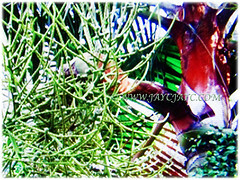 Features: Dypsis leptocheilos is from the genus Dypsis that consists of about 162 accepted species of palms. 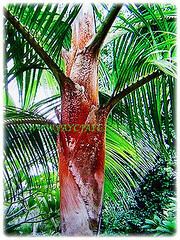 It is a slow-growing and medium-sized palm with an obvious solitary trunk that can reach a maximum height between 7-10 m. Its trunk is about 25 cm in diameter and is prominently ringed with old leaf scars and crownshaft that is covered in dense reddish-brown velvet-like or fur-like fuzzy tomentum. It bears large, ascending to spreading, feather-shaped fronds and a brilliant contrast between its fuzzy red crownshaft and white trunk. It has a lovely green bamboo-like trunk that is covered in a white powder that will remain long when well protected, giving the trunk an almost white appearance. About 15-20 slightly arching leaves emerge from the crownshaft to from a fabulous crown. Leaves are pinnate or feather-shaped up to 3 m long. The glossy, dark green and pendulous leaflets are 45 cm long and 2.5 cm wide. They are held onto a 17 cm long petiole. The foliar base, about 60 cm long is covered by a thick brown reddish tomentum and envelopes only partially the stem in the outer leaves. Inflorescences are branched with flowers coloured cream to off-white, up to 1-1.7 m long and emerge from below the leaves. 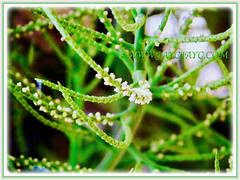 Teddy Bear Palm is monoecious with male and female flowers on the same plant. The globose fruits, measuring 1.2 cm in diameter are dark brown in colour, turning black upon maturity. It consists of only one globose seed that’s pointed at the base. 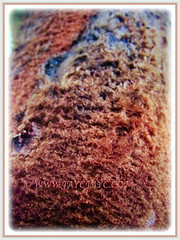 Its common names, Redneck Palm and Teddy Bear Palm refers to the colour of the crownshaft as it is covered in dense, reddish-brown and velvety hairs. 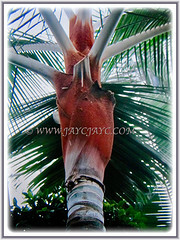 Culture (Care): Dypsis leptocheilos or Redneck Palm can be grown easily with least maintenance. Light: Grows best in full sun but can do well in semi-shade too. Moisture: Medium water requirement. It is drought-tolerant once established. Soil: Humus-enriched, loamy, slightly acidic and well-drained soils. However, it is adaptable to a wide range of soil types. Others: This beauty does not require any pruning. Nevertheless, trim off withered fronds once every two or three months to keep it tidy and aesthetically pleasing. Once every quarter, feed the palm with a slow-release granular fertiliser formulated for palms that has nitrogen, phosphate and potash. Generally, it is free from serious diseases and pests. 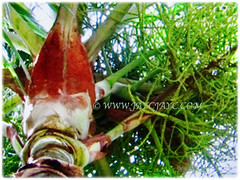 Nevertheless, watch out for the Palm-infesting whitefly, lethal yellowing, fusarium wilt, fungal and bacterial pathogens. 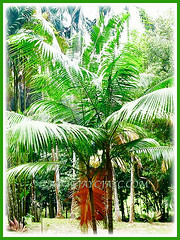 Dypsis leptocheilos or Redneck Palm is best suited to tropical and warm subtropical regions. It is cold hardy and can tolerate temperatures down to -3.88°C. It can handle cool temps to around 0°C, but will need to be protected from strong winds. When mature enough, it can even withstand light frost for a short period of time. It can be grown indoors as a potted juvenile. This impressive and unique palm flowers from spring to autumn. Propagation: Easily propagated from seeds that germinate in about two to four months. Advisable to soak seeds in warm water overnight before sowing. Usage: Dypsis leptocheilos or Redneck Palm with its ornamental foliage and reddish-brown crownshaft will be excellent as a landscaping palm. An impressive and unique palm tree to be planted in public parks and gardens to showcase its beauty.